Specifications Camera lens: 210°Fisheye lens*2 Video: 1080P@30FPS 720P@60FPS Photo: 12MP Battery: 1400 mAh WiFi: 802.11 b/g/n Record time: 2H File format: MOV/JPG Interface 1: Micro USB (data and charging) Interface 2: SD card Socket (data storage) Package list 1 x Poweradd 360°Panoramic Camera 1 x USB cable 1 x User Manual 1 x Welcome Card Industry-leading warranty,Here at Poweradd, we provide 24-months warranty and 24*7 friendly customer support for every purchase from us. 360°Panoramic View: Dual 210° fish-eye super wide-angle lens, made of 6 layers of high-definition optical glass, high resolution provides fully spherical 360 Degree images & videos. Ultra HD Action Camera: Professional shooting 1920P@30fps, 1472P@60fps video and 5MP photos. Purchase an SD card SEPARATLY, and insert and began to use the panoramic camera. VR Mode: Video recorded in VR mode with VR helmet can make you immersed the the incredible moment. Hand held Camera: Portable size & hand held let you record anytime and anywhere. APP Control: Download IDV720 APK to your smart-phone and connect with camera via built-in WiFi. Then operate and review the images or videoes,it is also easily share to Youtube and Facebook,etc. 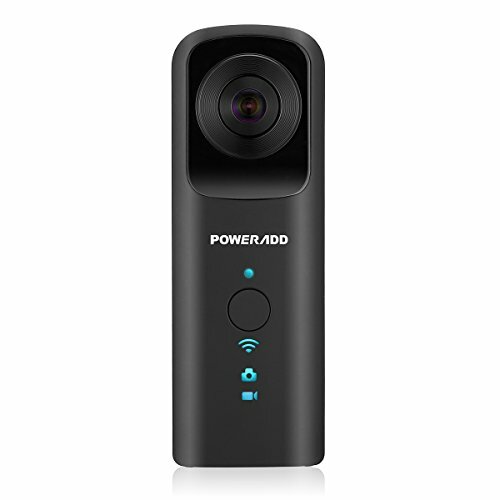 What you get: Poweradd 360 Degree Panoramic Camera,USB charging cable,User Manual,Welcome Card and 24 months warranty and 24*7days friendly customer service.